Karin Hellqvist started her violin studies at the Music Conservatory of Falun, Sweden. Later she continued to the Royal College of Music in Stockholm to study with prof. Anna Lindal. During the year 2006-2007 Karin studied at the Universität der Künste in Berlin in the class of prof. Axel Gerhardt. After completing her bachelor studies in June 2008 she is now studying at the Norweigan Academy of Music in Oslo for her with prof. Peter Herresthal and prof. Terje Moe Hansen. During her studies Karin focus mainly on new music performance. As a member of new music ensembles Curious Chamber Players and Oslo Sinfonietta she is frequently giving concerts, touring and commissioning works by the young generation of Scandinavian composers. She has also worked with the Swedish electric guitar ensemble KROCK in premiering Swedish composer Fabian Svensson's violin concerto. 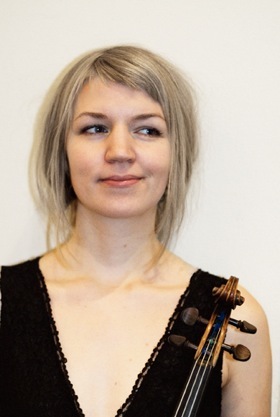 With her trio Trivium, consisting of violin, flute and guitar, she has comissioned works by several young Swedish composers. In 2007 the ensemle were selected to participate in the Swedish Chamber Music Society's biennial lancing programme, Ung & Lovande. In 2006 Karin took part in the Ensemble Recherche ensemble academy in Freiburg. Karin has performed at festivals such as Stockholm New Music, Nordic Music Days, ULTIMA, Oslo, Présences, Paris, Siren Festival, Göteborg, Spor Festival, Århus and Arena Riga. In 2008 she guested the Royal Swedish Ballet School in Swedish composer Dror Fieler's piece for solo violin, Sparagmos, with concerts in Sweden and on Iceland. Karin has been awarded with several scholarships, many recognizing her talent as a Swedish folk musician. She has been touring in Europe and the USA both as a fiddler soloist and with different folk music groups.